NEW YORK (WPVI) -- President-elect Donald Trump vowed Wednesday to unify a deeply divided nation, having scored a stunning victory backed by extraordinary support from working-class America. The tough-talking New York billionaire claimed victories in the nation's premier battleground states, but his appeal across the industrial Midwest - Pennsylvania and Wisconsin, in particular - sealed a victory that defied pre-election polls and every expectation of the political establishment. 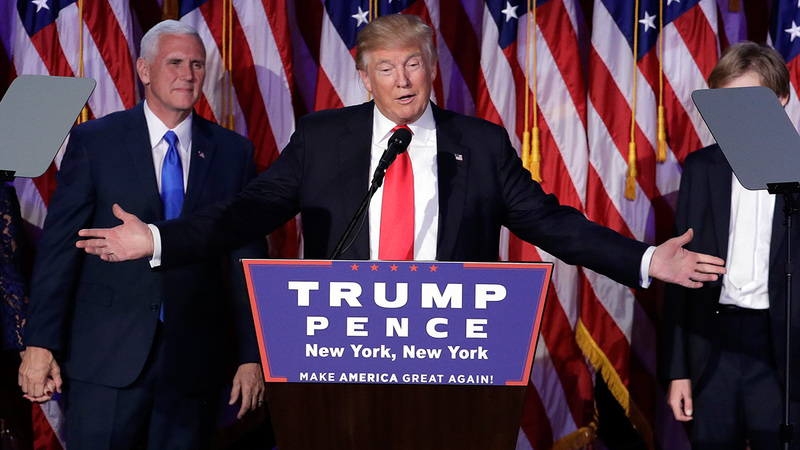 Donald J. Trump, who will be the 45th president of the United States, delivered his victory speech on Election Night. Trump addressed the nation after sweeping most of the nation's top battlegrounds - and created some new ones. A look at Republican nominee Donald Trump's day for the 2016 election. Some were branded resume lightweights: ex-governors George W. Bush of Texas, Bill Clinton of Arkansas and Ronald Reagan of California, among them. But they had served somewhere - whether in Congress, states or in a leadership post in an administration.